Officially accredited organization for works on the classification of hotels and other accommodation facilities ("assignment to the category of stars"). 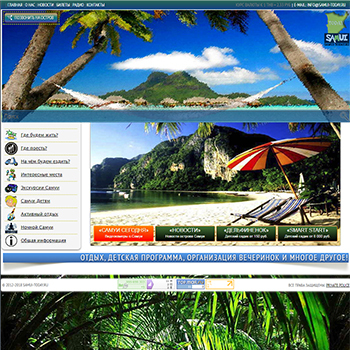 Creation, administration of the site (Wordpress). 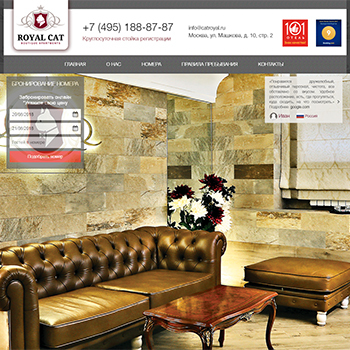 Information site with the possibility of on-line booking and payment. 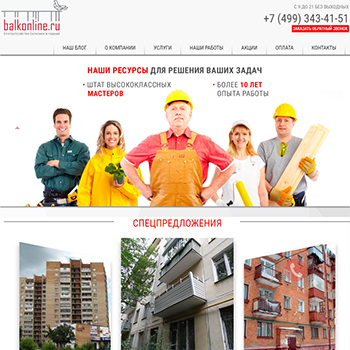 Site administration (Wordpress), customization of various modules. 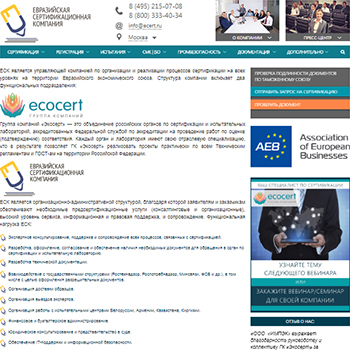 Certification of products, goods and services. Conducting an advertising campaign Yandex.Direct. Glazing and repair of the balcony and loggia on a turn-key basis. 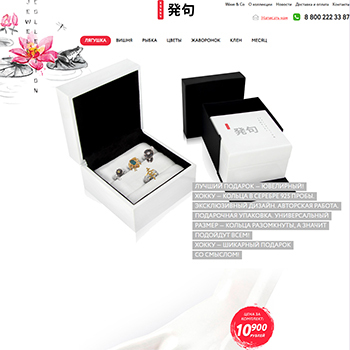 Creation of a site, development of modules, advancement in the Internet. SEO-specialist: Conclusion of the site on topical requests in TOP-10, achieving maximum visibility of the site through promotion in search engines for the largest number of thematic queries in this industry. Work with SEO programs and SEO services. A set of subscribers to social networks: Vkontakte, Youtube, Facebook, Instagram, G +. 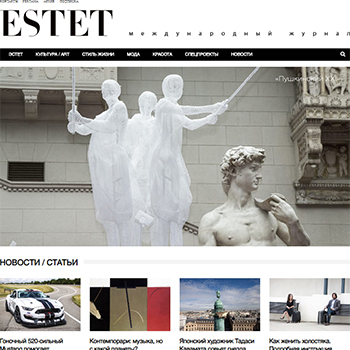 ESTET - International magazine for those who are interested in the trends of modern socio-cultural space, everything about beauty, lifestyle, art and culture. 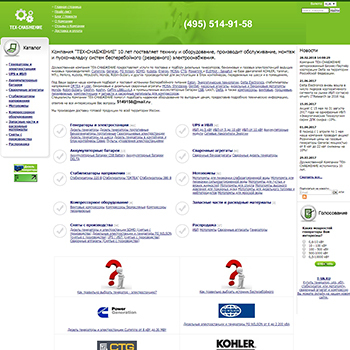 Creation of sites, development of modules for company web-sites. 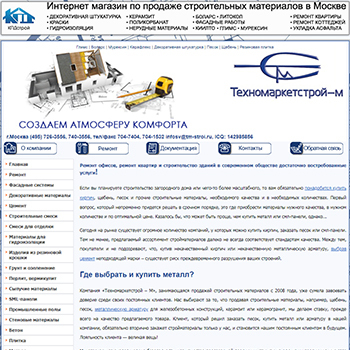 Website creation, development of modules. 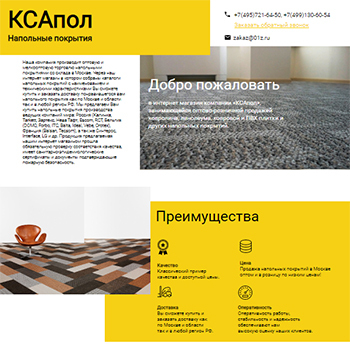 The company produces wholesale and small wholesale trade of floor coverings from a warehouse in Moscow. 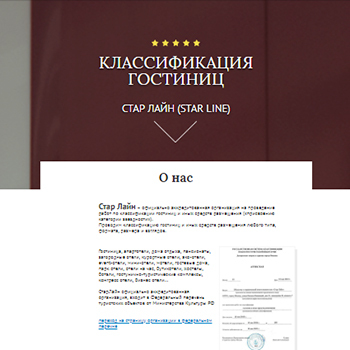 Creating Landing-page, compiling an advertising campaign Yandex.Direct, Google AdWords. 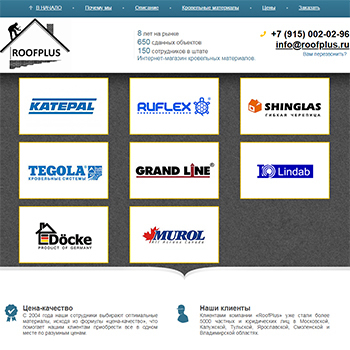 The company produces wholesale and small wholesale trade of roofing materials from a warehouse in Moscow. 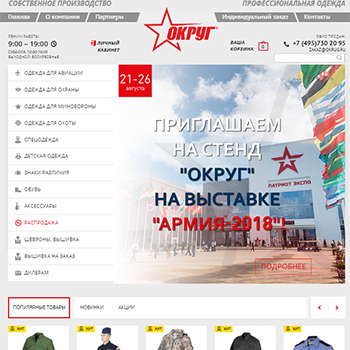 Creation of landing page, processing and filling with content, including processing graphic objects; Creating an advertising campaign Yandex.Direct, Google AdWords, market analysis, competitors. Conclusion of the site on topical requests in TOP-10, achieving maximum visibility of the site through promotion in search engines for the largest number of thematic queries in this industry. Work with SEO programs and SEO services. Systematic mailing on target mail databases, drawing up layouts (layout, processing photos). 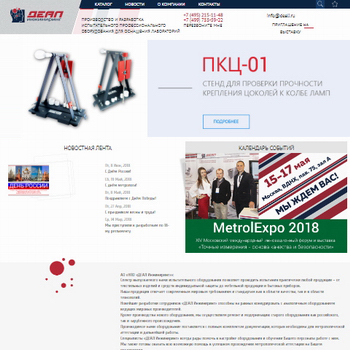 Creation, administration of an online store (OpenCart), Landing Page, imposition of layouts for mailing lists, mailing lists, development of modules for company web-sites. Conclusion of the site on topical requests in TOP-10, achieving maximum visibility of the site through promotion in search engines for the largest number of thematic queries in this industry. Work with SEO programs and SEO services. Information and analytical resource, a review of current events and political life of the country, a historical digression to the activities of the police of pre - revolutionary Russia. 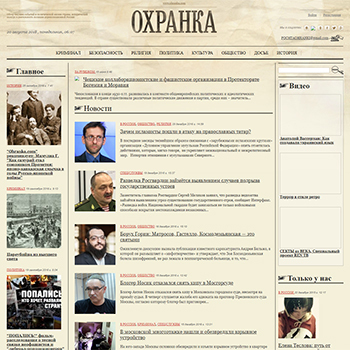 Archive of news and rare literature. 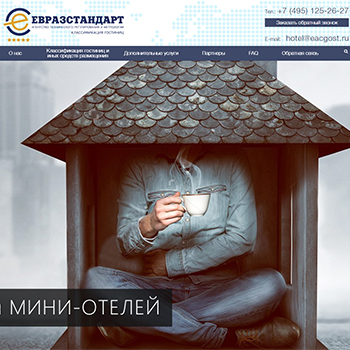 Creation, promotion of the site: SEO, SMO, SMM, contextual advertising Yandex.Direct, Google AdWords. Deliveries of equipment and machinery. 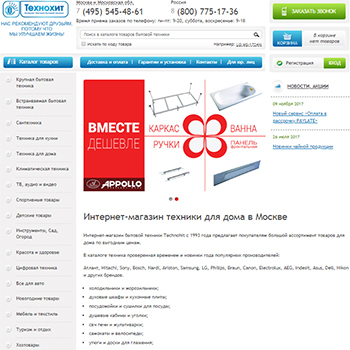 Creation, promotion, administration of the site - SMO - SMM - SEO, contextual advertising Yandex.Direct, Google AdWords. 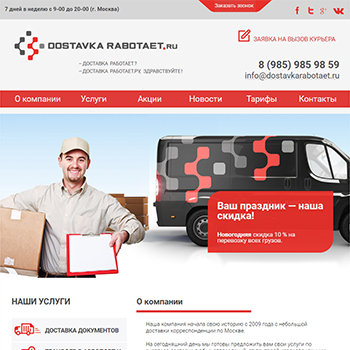 Delivery service; Delivery of correspondence, children's goods, clothes, gifts, bicycles and household appliances. 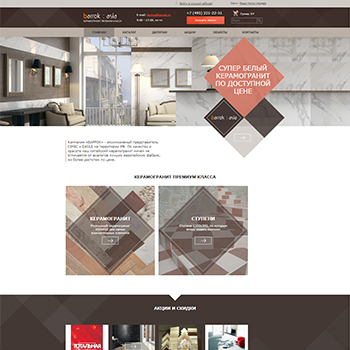 Porcelain tiles: Sale of tiles from porcelain tiles. 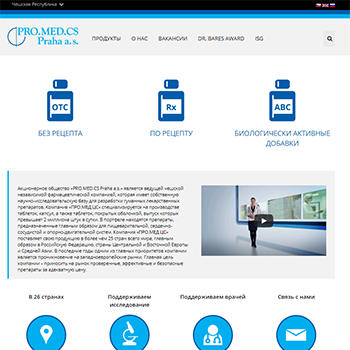 Pharmaceutical company - Promedtss Praha - Manufacture of medicines. System administration, Maintenance of infrastructure in working order, creation of sites for honey. 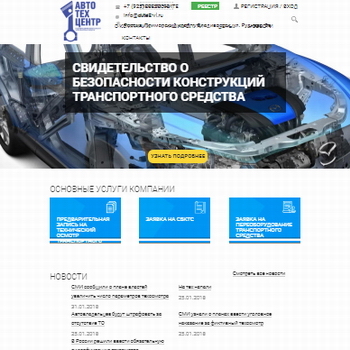 preparations of the company, Website promotion med. preparations of the company. 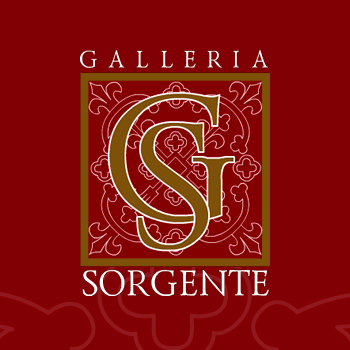 Work to eliminate resources that discredit the honor and dignity of the company. Conclusion of the site on topical requests in TOP-10, achieving maximum visibility of the site through promotion in search engines for the largest number of thematic queries in this industry. Work with SEO programs and SEO services. Create a html-version of the site based on the flash version. 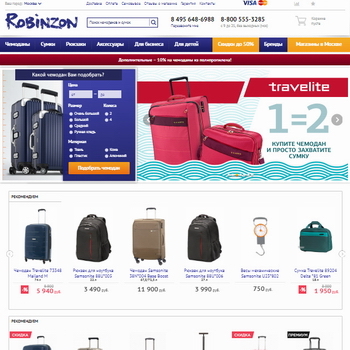 Internet shop: suitcases, backpacks, bags. Internet-shop: Sale of home appliances.